Hana needed a change. The Nail Salon on a busy street in east Columbus was refocusing its business away from nails, and branding ts offering to include a host of other beauty services. At the same time, Hana had an extremely loyal clientele and did not want to lose any other it. The purpose of any effort needed to be a gentle nudge towards the other services Hana now offered. 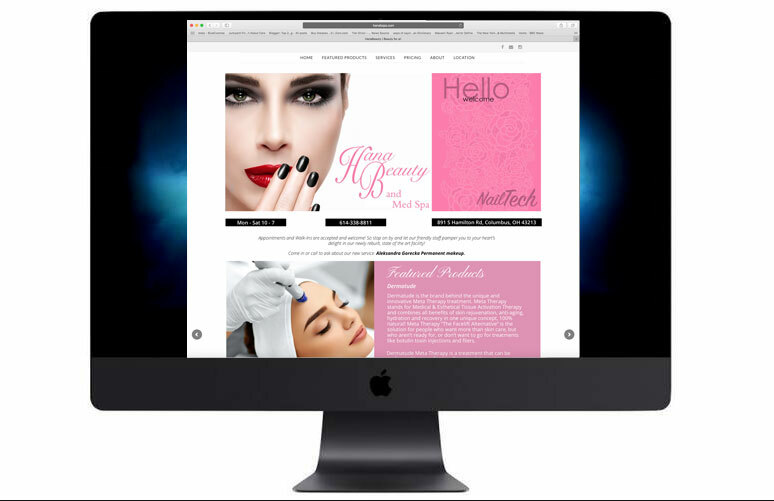 The nail and beauty industry is extremely competitive, and often an expansion or addition os things like new space or services mean an increase in costs – something easy to turn away from as a customer. Hanas business marketed itself via its location. That was it. A sign out in front of its place and signs in the window was the only means of making itself known. At the same time, the internet space and all of its advantages were becoming more and more crowded with her neighbors. Several organizations are offering packaged services for companies like Hana’s. None provided the type of personalized services in copywriting and design Hana offered her clients. Her feeling is she listens to what clients want; then she gives her professional interpretation. BlueCozmos worked with Hana to create a new brand identity and web presence. The purpose was clear: Provide a search engine rich site allowing for a minimum of effort and costs of google adwords to achieve a high search ranking. All the while, put a fresh appearance on the salon, define the owners experience in detail and list all services. Hana is cross-selling services. As a result of the website, she now can offer an entire suite of services to existing as well as new clients. Her in-store purchases have increased 28% on average. She is about to open a second location.